“Although it is difficult to be a journalist at this time, not only in Iraq but also across the world, journalists still play a key role in democracy. 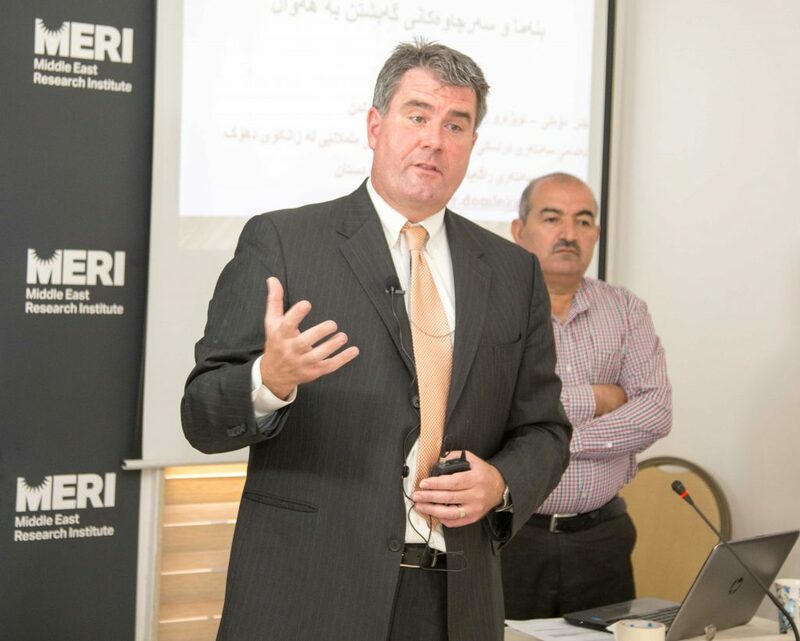 Journalism is not only a job but a mission” stated Steven Gillen, the US Deputy Consul General in Erbil, Kurdistan, Iraq, during his opening speech at a training-workshop, MERI held on 02/05/2018. The workshop was a part of a series of media training events for Journalists in Iraqi Kurdistan Region, funded by the US State Department via the US Embassy in Baghdad. 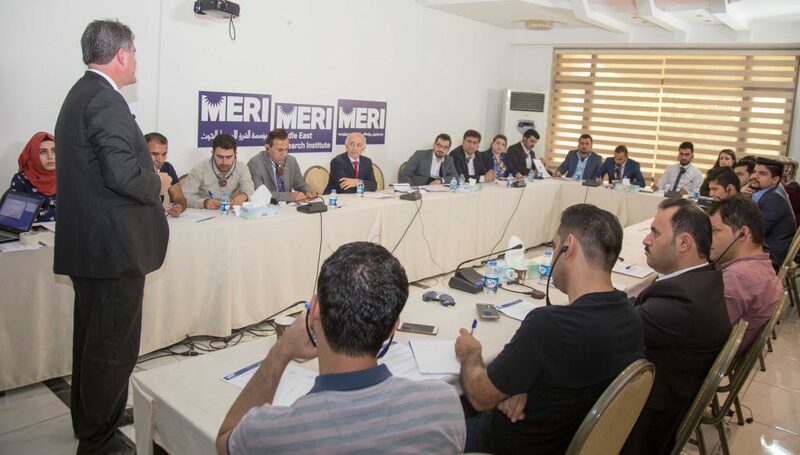 This grant will provide nine training sessions to 200-225 journalists across various provinces, including Dohuk, Erbil, Sulaimania, Kirkuk and Halabja. The overall aim is to improve the overall quality and professionalism of journalism, increasing adherence to ethical standards and supporting ongoing democratisation and human rights efforts. Participants of the first training session included 29 journalists from various TV and news outlets, representing different demographics including women, ethnic and religious minority groups and journalists from primary news sources. The course was delivered by Mr Khidir Domlayi, a professional trainer of journalism, and MERI research fellows. In addition to detailing fundamentals of modern investigative journalism, standards of reporting, ways of accessing information and credible data, and the concomitant social responsibility of journalism, participants were exposed to firsthand experiences of journalists who have worked both in Kurdistan and the US contexts. The New York-based Kurdish journalist, Majeed Gily, compared his work in both environments, highlighting what makes a good journalist, regardless of contexts, is credibility which is attained through gaining accurate and verified information. Furthermore, the training shed specific light on the mechanisms of asking strategic questions and press for answers and information. For this, the case of Kurdistan Parliament and its interaction with journalists was detailed where two experts from the Parliament, Mr Tariq Surmayi and Mr Fuad Ahmed, engaged deeply with the trainees in informative debates. When receiving information and statements from sources, journalists need to familiarise themselves with laws, regulations and decision as well as fact-checking, particularly numbers and statistics. This may require reaching out to credible sources and references, research centers and think tanks. Finally, the trainees were exposed to conventional research tools think tanks and research centers often deploy in conducting research. These range from undertaking literature review to conducting either qualitative or quantitative surveys or interviews in the field. Therefore, such avenues are important destinations for journalists to gain information and analyses from. It is worth noting that these training sessions are designed to improve journalists’ capacity and skills to represent democratic values and standards, highlight the fundamentals of contemporary and investigative journalism, and underline social responsibility of journalism. While contemporary journalism provides the general knowledge on how to be a writer, a reporter, an editor in modern days, investigative journalism emphasizes the need to apply rigorous research methods to find out details of a topic over a protracted period of time. Social responsibility, on the other hand, plays a key role in journalism, as it allows freedom of the press while holding journalists accountable.